Only the 2013 Ford Fusion could mix oil and water with good results. Ford is promoting the new 2013 Fusion by again delving into trans-media marketing with a new promotion called Random Acts of Fusion. Ford has been a pioneer in the multi-media promotion of its vehicles. This teaming of McHale and Seacrest was long overdue. 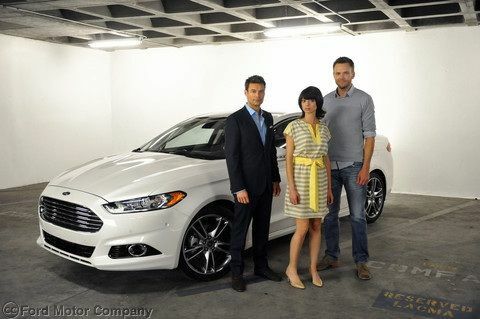 Also included in the 2013 Ford Fusion promotion is Kate Micucci. In addition to her very interesting last name, Kate is an actress who many saw first on Scrubs. She is also half of the comedy-music duo Garfunkel and Oats*. McHale is better known. He has his own comedy program on E! called Talk Soup. Many of the Talk Soup punch lines include the name Ryan Seacrest. McHale is also part of the cast of Community, an NBC TV sitcom. Presently, Ryan Seacrest does everything else. By bringing together these two apparent rivals Ford is introducing a little spice to the promotion. A look at the You Tube video below reveals that the spice is more black pepper than Cayenne pepper. The Fusion has been transformed with a new look. Many people who view the Fusion from the front see the Aston Martin. This is not at all a bad thing. The Fusion has also followed the lead of the Hyundai Sonata and Kia Optima by eliminating the V6 power plant from its line-up. Instead Ford will use a combination of normally aspirated, turbocharged, and hybrid 4-cylinder engines. The idea is that fuel economy will surpass the desire for a powerful smooth V6 in the coming years. The Accord and Camry have retained their V6 models, so it remains to be seen if Ford is on the right path. Although most buyers opt for the 4 cylinder cars, having the powerful V6 in the line offers some marketing advantages. The full story of the Random Acts of Fusion promotion will be revealed tonight on FOX.